Every. Single. Year. My dad brings bagfuls of broad beans back from the allotment. When they’re young and fresh, they’re a dream. So tender and sweet, they’re perfect when boiled and eaten straight up with a scattering of salt. As the weeks go on though, I always become a bit disenchanted by them. The little pod wrapped around each bean isn’t as buttery-soft and they err on the bitter side. This is the stage when they need flavour friends! 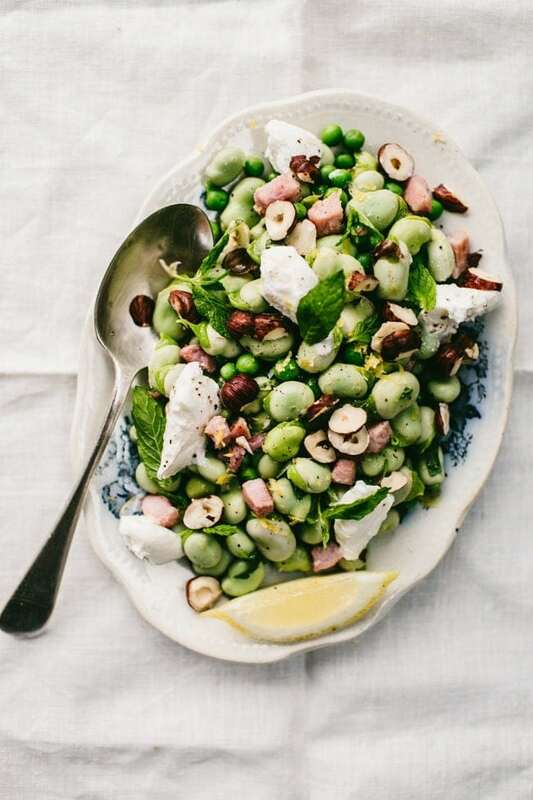 A mint/pea/ricotta/broad bean combo is super classic (you’ve seen it before, no doubt) and very summery. 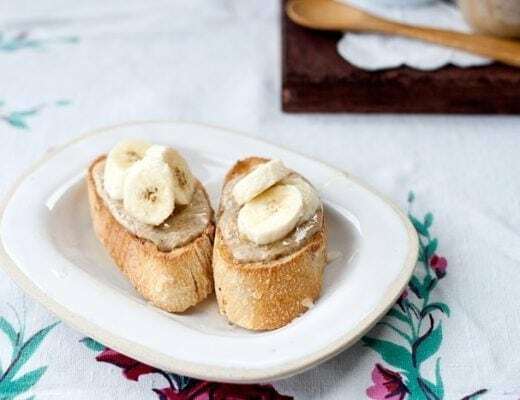 This particular recipe I learnt of when I was doing work experience a few years ago with the lovely food stylist Joss Herd. She was working on a shoot for Harry Eastwood’s cookbook ‘A Salad For All Seasons’. Obviously everything we made was salad, usually 6 different ones a day, and they were scattered all over the kitchen. 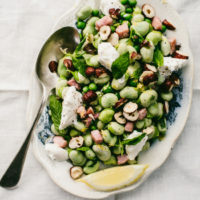 On my first day, we all sat down to lunch (on many salads, of course) and this broad bean & ricotta dish really stood out for me. It was so simply dressed, with just olive oil, lemon & zest and salt, but it was all that was needed. Milky ricotta and salty pancetta spangled the plate, enriching the otherwise green dish. It really was a match made in heaven! 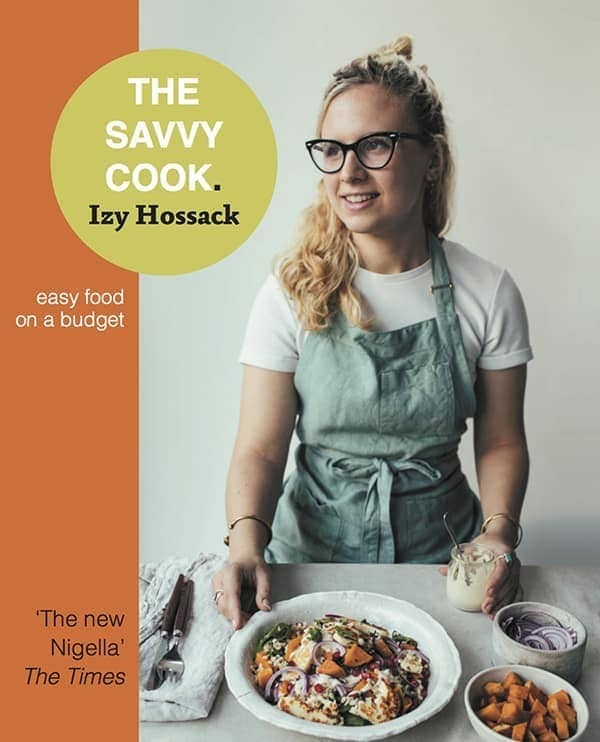 Luckily a few months later I ordered the book and got a hold of the recipe for myself so now I’m passing it on to you 🙂 The only change I’ve made here is adding some chopped, toasted hazelnuts for a bit more crunchy texture – if you’re not a fan, swap/leave them out. *I used frozen petit pois! Bring a medium pot of well-salted water to the boil. Add the broad beans and cook for 6 minutes. 2 minutes before the beans are done, add the peas to the water too. 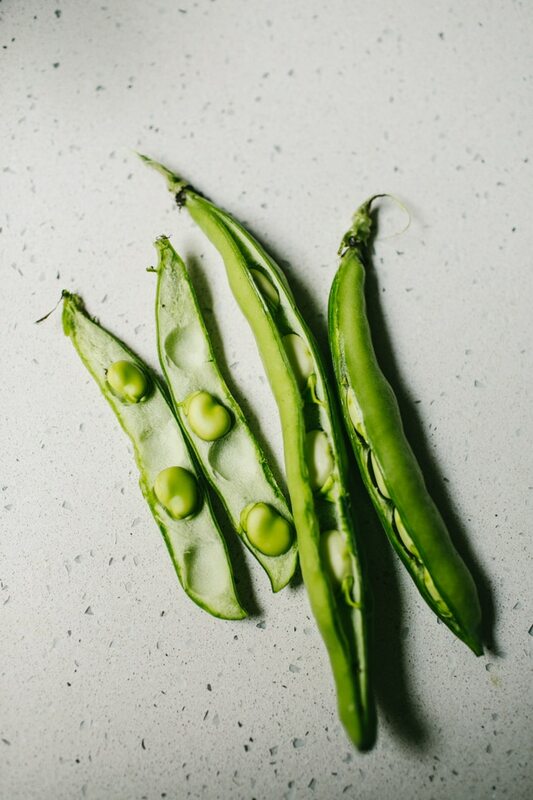 Drain the broad beans and peas, rise them under cold water until only slightly warm. Place them back into the pot along with the olive oil, lemon zest and juice. Stir then season, to taste, with salt and mix in the mint. In a small pan, toast the hazelnuts over a medium heat until the skins start to become flaky and the nuts are fragrant. Pour the nuts onto a cutting board and roughly chop them up. In the same skillet, fry the pancetta over a medium heat until crisp. Remove from the pan leaving behind as much of the fat as possible. Stir the pancetta into the pot of beans too. Pour the contents of the pot out onto a platter and dot with spoonfuls of ricotta. Sprinkle over the hazelnuts and serve. 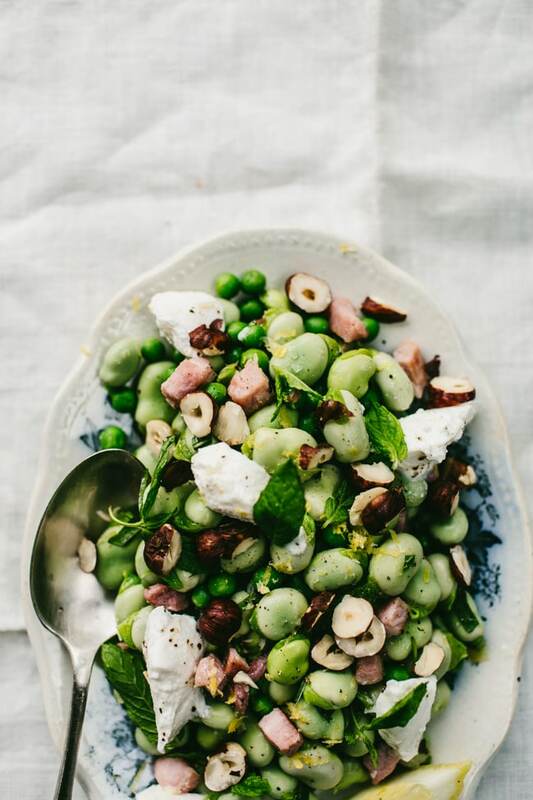 Beautiful look salad and looks perfectly refreshing for this weather at the moment! I love that you’ve used them in their skins, that’s the beauty of young broadbeans. They are my Polish childhood food memory – summer afternoons spent eating them – bought from the markets or street stalls, steamed lightly. The salad looks amazing Izy! Broad beans have such a bursting texture that I love. And the ingredient combo in this salad fair is a textural extravaganza. Not to mention taste! I love the different textures going on! Yum! This looks so fresh and delicious! Thanks for the scrummy recipe. Amazing!!! Looks wonderful, and the cheese…perfect!! This recipe sounds so delicious and has great eye appeal. Thank you so much for sharing!